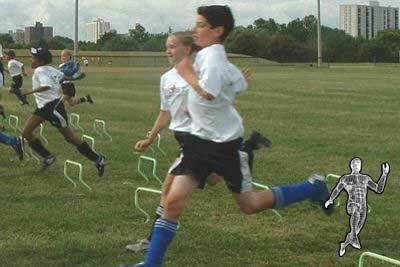 Provide a fun environment for learning about speed training and how it applies to different sports. Enable athletes to become more co-ordinated, faster and confident in playing and competing in different sports. All programs available during the day and normal evenings. DON'T MISS THIS OPPORTUNITY TO STAY AHEAD OF THE COMPETITION! Excellent Pre-Season Training for Hockey!! This is our multiple purpose program designed to accommodate novice to rep players. The Program: 5 weeks - 2 times a week - one hour sessions - pre and post session testing so the players and coached can monitor their progress. Who would benefit: All serious athletes from age 9 and up. Individuals, teams or one on one. This program is designed to prepare teams or individual players for the upcoming season or in season maintenance. The Program: 15 weeks - once a week - one hour per session of intense training. Pre and post program testing so the players and coaches can monitor their progress. Who would benefit: Only serious rep players or teams from ages 11 and up. This program is for teams or individual players who are competing at Provincial or National levels. The Program: 15 weeks - once a week for 1 hour of intense training. Who would benefit: Only teams or players from age 11 and up. This program is for the serious athlete who is looking to improve his or her speed, agility, and quickness for the outdoor season.We are also for the first time are adding and strength training component to the program. We will customise a strength training program for the individuals specific needs. © 2005 Speed Factory Inc.